Hi, my name is ¬_Kayla Bartley and I’m Madison Day and we’re from Springport Middle School_ and here’s what’s going on around town for kids like us. LANSING, Mich. — Hi, my name is ¬_Kayla Bartley and I’m Madison Day and we’re from Springport Middle School_ and here’s what’s going on around town for kids like us. (KAYLA) Join Meridian Township for this fun, free fishing event! 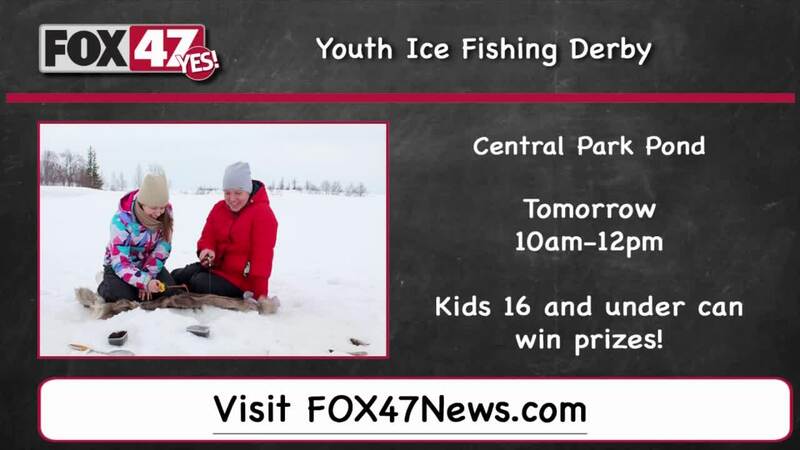 As part of Michigan DNR's free fishing weekend, your family will enjoy the Youth Ice Fishing Derby for all ages. (KAYLA) Ice fishing equipment and bait will be provided. Participants may bring their own equipment if they choose to do so. Registration will be at the event. (MADISON) Kids 16 and under are even eligible to win prizes! (MADISON) The event will take place at the Central Park Pond. The event is free and no fishing license is required. (MADISON) For more info on events like this, go to FOX 47 news dot com, my name is Madison Day (KAYLA) and I’m Kayla Bartley. (BOTH) now back to the FOX 47 studios.